Page Street Publishing, 9781624143014, 208pp. Start your baby on a nutrient-dense journey by preparing his or her first foods from scratch with healthy whole-food ingredients. Steal their taste palates away from processed ingredients by getting back to the basics. Your care in the first years will result in a child who knows where their food comes from and who won’t shy away from fresh vegetables or wholesome ingredients. Plus, the recipes come together in a pinch and will save you time and money along the way. Renee Kohley’s healthy foods nurture not just baby, but are delicious for the rest of the family, too. With recipes such as Bone Broth for baby transformed into Fresh Spring Vegetable Soup for the rest of the family, Renee provides simple tips to feed more hungry mouths faster, easier, cheaper and more nutritiously. With everything from single-ingredient purees for newborns to fuller meals that incorporate grains, nuts and legumes for toddlers, you have all your bases covered. With Nourished Beginnings Baby Food you will help your child develop healthy eating habits for life. Renee Kohley is the mom of three behind the website Raising Generation Nourished, where she helps parents raise the next generation of nourished kids with recipes and information on the traditional foods diet. She has been a featured writer on Nourished Kitchen, The Prairie Homestead, Mommypotamus, Super Healthy Kids, Live Simply and Natural Fertility & Wellness. Renee and her family live in Grand Haven, Michigan. "When it comes to elegantly simple recipes proven to be both nourishing and delicious, Renee positively shines. The simple ingredients and flavors are sure to be a hit in my home as well as others. Five stars!" "Renee's book is just what our world needs. Almost all of the common diseases afflicting our children (and adults) today have a root in poor nutrition. Starting our children off right, from the very start, is going to be key to their long-term health, and Renee shows us how to prepare nutrient-dense foods that even the pickiest eaters will like. This book is not just for new parents. It's for ALL parents." 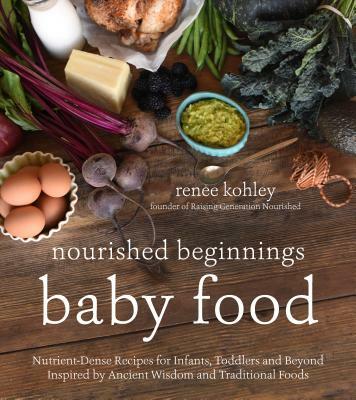 "In Nourished Beginnings Baby Food, Renee offers an invaluable resource of approachable family recipes to help your family confidently lay a nourishing foundation for a balanced and practical real-food lifestyle." "Renee's Nourished Beginnings is an absolute must-have in any parent's library. She teaches you how to get your children hooked on real, nutrient-dense, traditional foods no matter their age, with a special focus on making every bite count for babies and toddlers. This is especially helpful for new moms or otherwise busy parents who want to feed their children the best food possible made from whole ingredients."